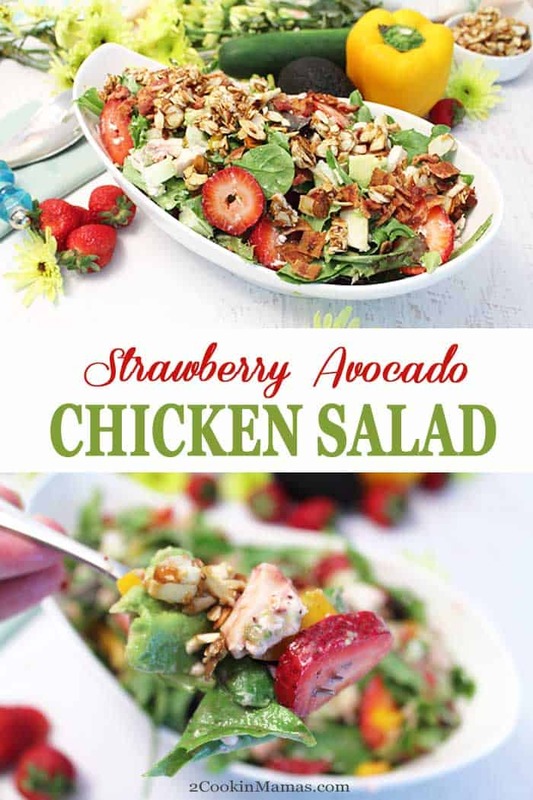 Whip up this healthy Strawberry Avocado Chicken Salad with the help of rotisserie chicken & fresh seasonal strawberries. It’s quick & easy and perfect for lunch or dinner. Here in Florida we still have strawberries by the carton-full on sale in our stores. 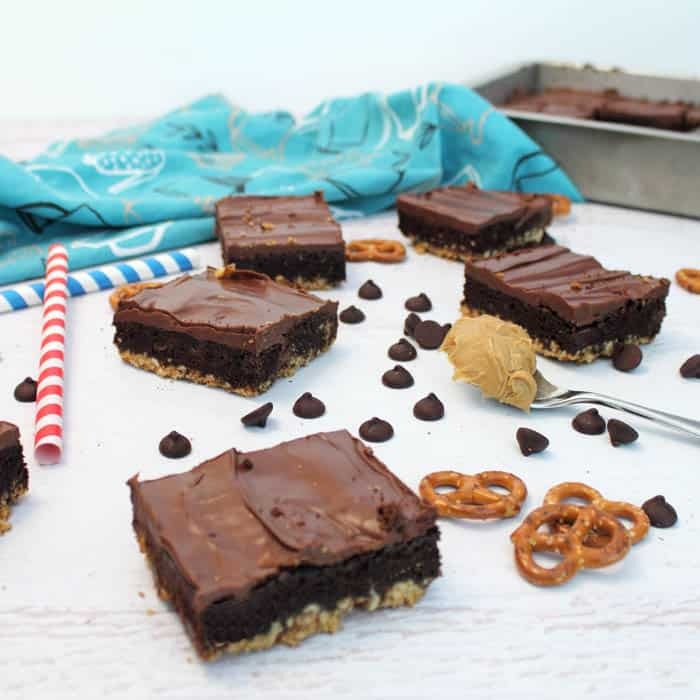 They are so sweet and delicious now that you can make anything with them and it will be fantastic! I have made pancakes & waffles with strawberry topping, yogurt parfaits for breakfast and dessert, smoothies, strawberry shortcakes, breads & muffins, strawberry lemonade and, even easier, just popped them in my mouth for a quick pick-me-up. This recipe today is quick and easy and full of lean protein, vitamins, minerals and healthy fat. 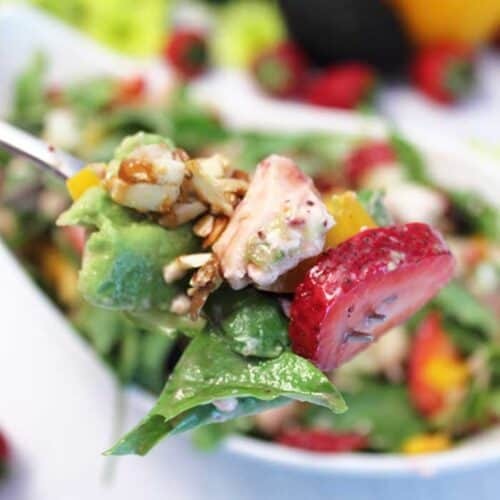 It is hard to go wrong with a salad that has a mix of everyone’s favorite fruits, vegetables and nuts. And buying a rotisserie chicken cuts down on the time substantially and lets you get it on the table in less than 30 minutes. What mom wouldn’t love that? All you need to do is chop the chicken and slice the strawberries, cucumber and bell pepper. Then mix with greens and goat cheese and, just before serving top, with sliced avocado, candied almonds and your favorite vinaigrette. I love the flavor that raspberry vinaigrette adds to the freshness of the salad but really any nice light dressing will work. 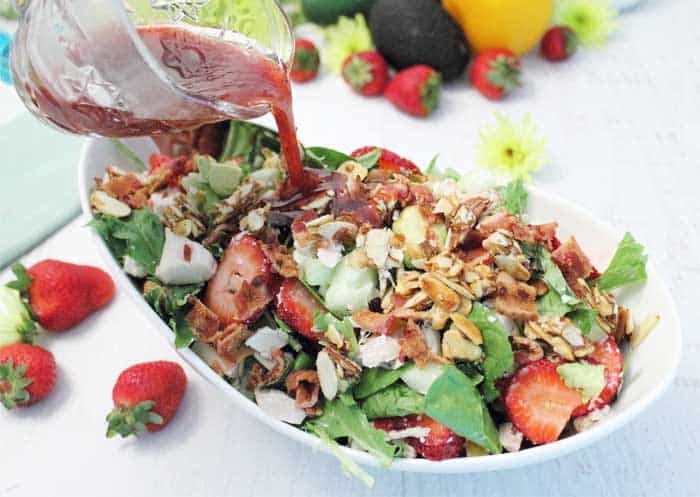 The bacon, which can be sprinkled on top, is totally optional but it gives the salad a little salty taste which is a nice addition to the sweet. This really is the perfect salad for summer! Enjoy! 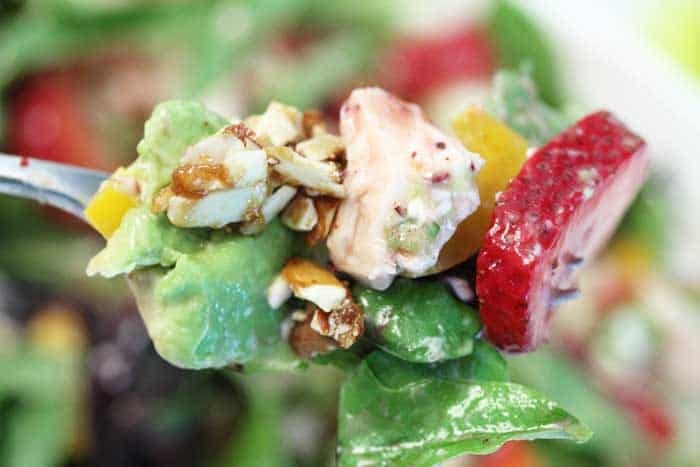 Whip up this healthy Strawberry Avocado Chicken Salad with the help of rotisserie chicken & fresh seasonal strawberries. It's quick & easy and perfect for lunch or dinner. Place the greens in a bowl. Top with remaining ingredients. Toss well. To candy almonds, place 1 tablespoon brown sugar in a small skillet. Heat until sugar begins to melt, add almonds and toss to coat. Cook until nuts are lightly toasted. At this point you can sprinkle a little cayenne pepper on them if you like a spicier taste. Pour the nuts onto a greased cookie sheet or parchment paper and allow to cool. Once hardened, break into pieces. Mmm, this salad looks so good! I think every salad needs avocado and bacon! Thanks Britt! My thoughts exactly! I love strawberries on a salad. They add so much flavour with not many extra calories. 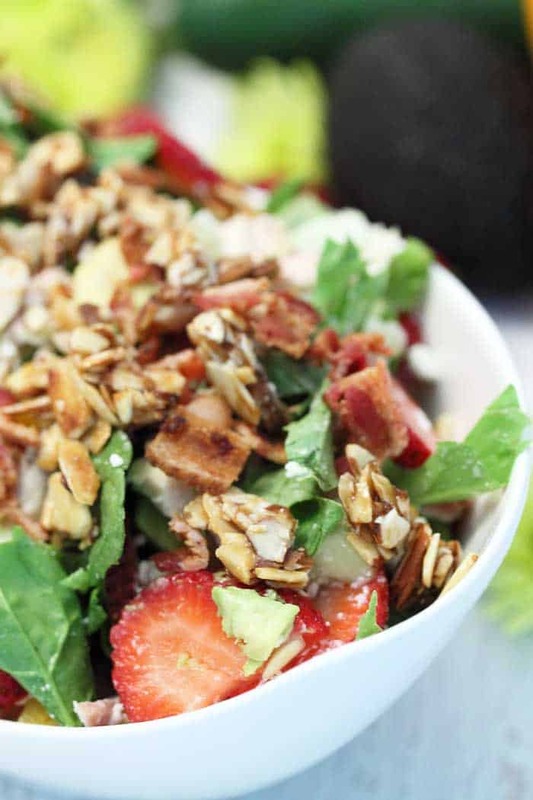 They certainly brighten up this salad and add a little bit of sweetness to the mix. It’s a great low cal salad for summer. 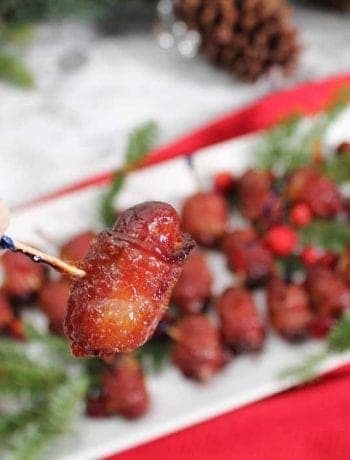 Well first you can never go wrong with bacon. Berry season is just around the corner. This would be perfect for summer eating. This is my favorite use of rotisserie chicken – in a salad, bright and refreshing! Me too Tina! And it makes the meal come together so quickly too. It’s quick, easy, delicious and healthy. This looks delicious!! I love sweet and savory mixes in salads. Such a nice way to use seasonal berries, too! Thanks Sue! I love berries in salads and strawberries are one of my favorites. It’s a great flavor combo. Yum…this is my kind of salad. Full of flavor and lots of delicious ingredients. I would serve this any time of the day. Wonderful. It’s a pretty hearty salad that works as a brunch or lunch meal but also as a lighter dinner. I think I’ll be including it in the mix for my Mother’s Day brunch.